Peruse the sights, sounds, and flavors of one of Europe’s great societal treasures – the Christmas markets. Many of you may have grieved along with Berliners as they mourned the tragic vehicle attack on one of Berlin’s Christmas market on 19 December 2016. I grieve with Berlin, Aleppo, Zurich, Yemen, and countless other cities across the globe afflicted by violent acts of cowardice and terrorism. I actually began conceiving of this post before this week’s attack, as, ironically, I had just visited Christmas markets in Munich and Madrid the week before. I seem to have a knack for unintentional timeliness. Or good fortune to have not been in the wrong place at the wrong time. At any rate, this blog post wasn’t meant to capitalize on the recent attack. Call it bizarre coincidence I was writing about it. Another side note: If you follow this blog, you may have wondered why your email inbox had less spam over the last few months. I did not drop off of the face of the planet. I just made a bit of a career change, and my new job has been sapping my time and creative drive. The sad fact is I actually have tons of great blog material but lack the energy to write. Someone needs to rediscover work-life balance. But I couldn’t allow the holidays go by without addressing one of the most fun culinary times of the year! So here you go. For years, I’ve wanted to experience Germany at the holidays. I remember reading about the famous Christmas markets in Nuremberg as a young child, my imagination filled with wonder for all the toys, sweets, and decorations kinder could handle. 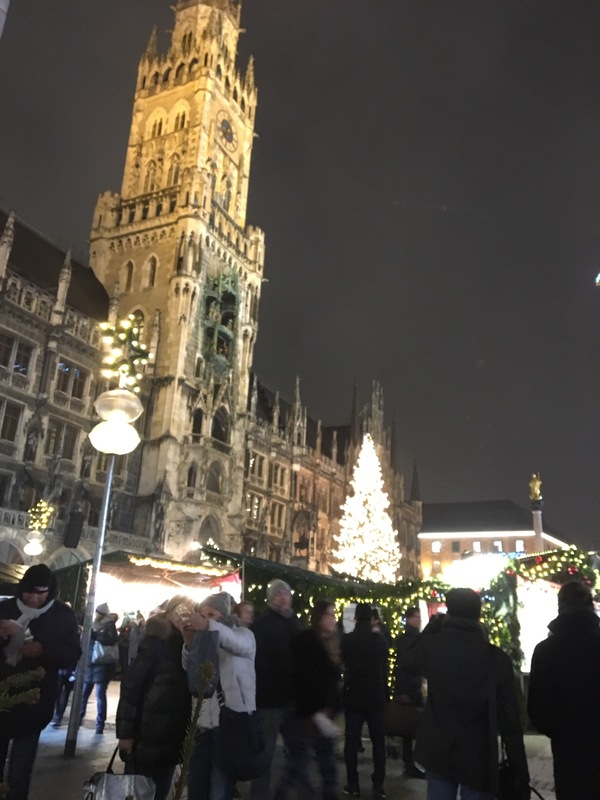 When a last minute business trip came up to Europe, I was so busy I forgot about the Christmas markets until the night I left for Munich. A quick Google search later, I had a game plan for my arrival. I had just one problem: Very little time and sleep deprivation. I almost skipped out on venturing to the Christkindlmarkt in favor of sleep and warmth. (Have I ever said how much I hate cold weather?). I dragged myself out into the bitter cold, the remnants of an earlier “ice frost” still glittering in the trees. In the heart of Munich, approaching Marienplatz, pedestrian streets are festooned with light displays and overhead signage. 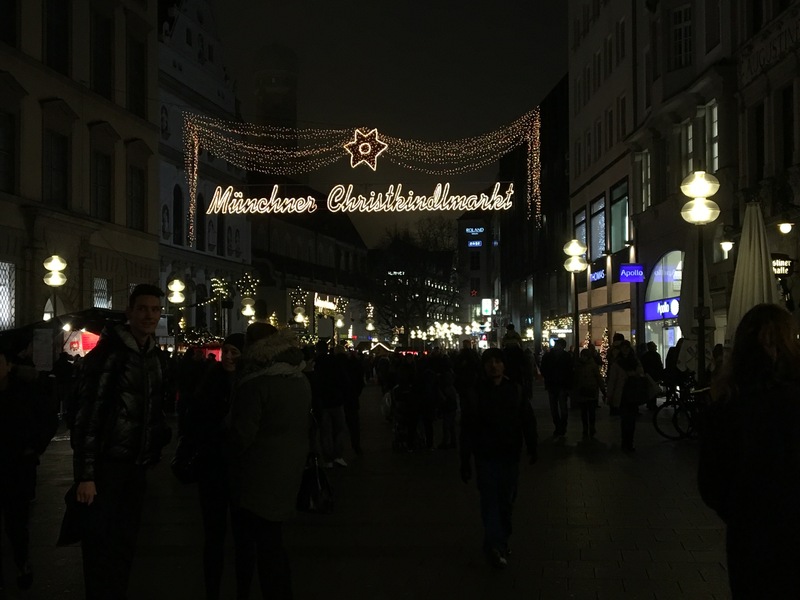 When I saw the “Münchner Christkindlmarkt” sign overhead, I couldn’t help but grin like a small child. And when I spotted my first Glühwein stands, my giddiness grew. I grabbed my €4 ceramic mug full of Blueberry glühwein and kept walking. Most people stop to enjoy their beverage and then return the mug, but I’m a pragmatic person. The hot mug was exactly what I needed to stroll and keep my (gloved) hands from going numb, because, I repeat, I am a wuss when it comes to being cold. So I enjoyed my wine while browsing the charming wooden stands packed full of Christmas wares. Ok, you really want to ask me, um, so am I supposed to know what Glühwein is? Is it a thing? Um, yes, it most certainly is a thing. Glühwein is a deliciously hot, sweet mulled wine. It is made with a variety of flavors. And some stands even sell a form of hot spiced beer. While intrigued, the idea was not appealing enough to try it. Quite frankly, it sounds disgusting. I’m hoping it’s more like cider. Maybe one day. Borrowed mug and phone camera in hand, I crossed off some items on my Christmas shopping list. It’s important to note that the Christmas markets are less market and more festival. 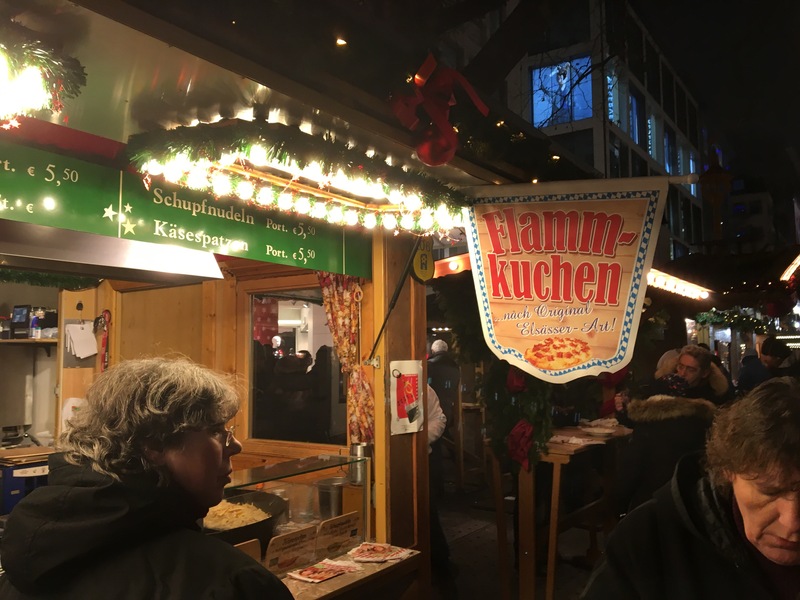 They are gathering spots for locals and tourists alike, offering perhaps more cooked food and Glühwein stands than all crafts and wares combined. Food stalls specialize in a range of specialties from all over Germany, not just the home state of Bavaria. Everything from savory currywürst (bratwurst smothered in curried ketchup) to flammkuchen (Alsatian pastry/flatbread topped with creme frâiche, bacon, and onions), to latkes, French fries, to crêpes (savory and sweet), sweet waffles, fritters and strudels, elegant pastries, hot chocolate, and candies. And, of course, beautifully decorated gingerbread that is a staple at German festivals. 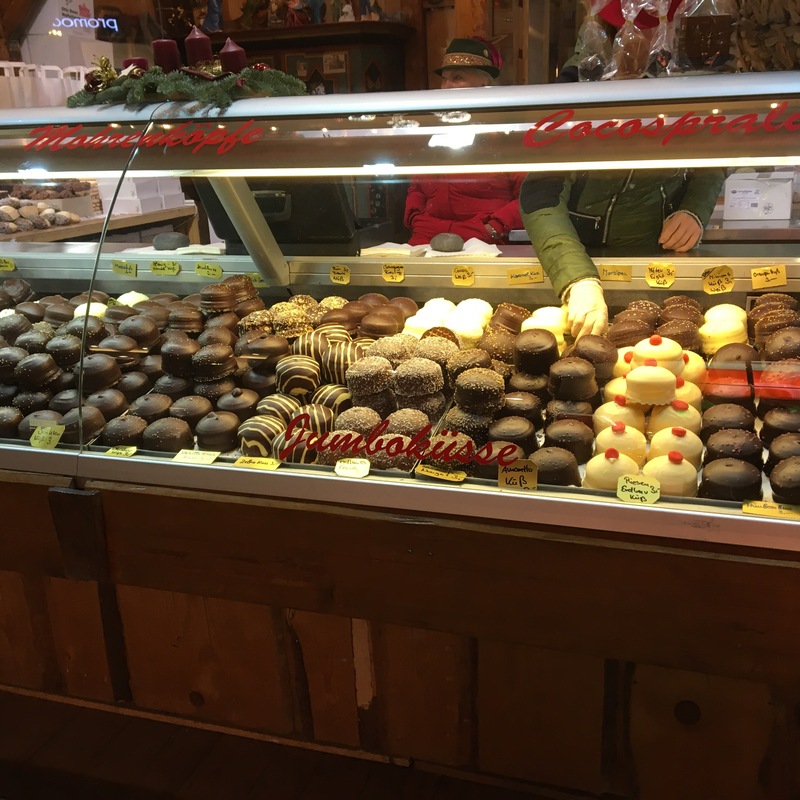 I walked past a stand of pastries, upon which row after row of perfectly round domes covered in chocolate or confectioners’ glaze with any flavor one might conceive of – think of every variation of chocolate truffle flavor and that comes close. I had no idea what the hell they were, but I was intrigued. So I bought one and stashed it away. 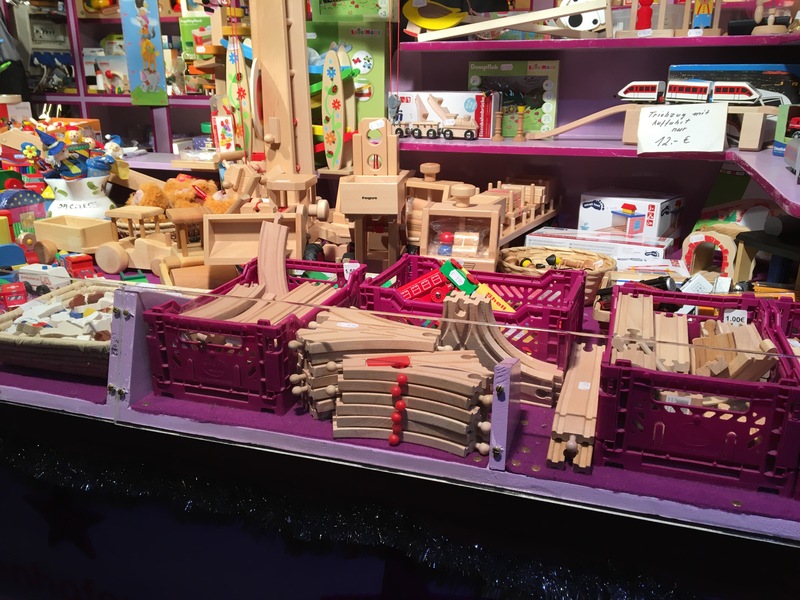 Slightly buzzed from my Glühwein – still shivering – and lack of sleep, I efficiently hit the craft and toy stands. If you want to stock up on beautiful Christmas ornaments and decorations, no better opportunity exists. I was overwhelmed by the endless variations of wooden Nutcracker men, but I finally chose one to take home to my family. Beautifully carved wooden crèches (nativities) filled stall after stall. I would have loved to bring one home, but regretfully, I considered them too large to haul back. It was amazing to see several stalls devoted entirely to selling glass ball Christmas tree ornaments. I had to skip those – no way am I capable of hauling them over 7000 miles and five airports, but I focused on -unbreakable! – straw, wood, and fabric ornaments. I had no shortage of choices: a multitude of straw designs, adorned with brightly colored thread or shiny beads; wooden figurines and 2D nativity scenes; plush, embroidered mice and angels. The ornaments are the epitome of Old World Christmas tradition and handicrafts (recognizing that for all I know, they could have been machine-made in China). Other stands purveyed more mainstream children’s toys and books. I was delighted to see a wide selection of Ravensburger games and puzzles – staples of my own childhood. I may have purchased a little something to pass on that tradition to my niece! Later that evening, I curiously opened my chocolate covered, marzipan Dome of Diabetes. It was NOT at all what I expected. I had assumed it was some sort of cake, perhaps with a layer of marzipan. Nope. Americans, it was kind of like a giant Mallowmar or marshmallow pinwheel. A thin, unsweetened wafer with the flavor and texture of a “cake” ice cream cone (why they are called cake cones still baffles me. Why aren’t they wafer cones?) formed the base. It was topped with a massive marshmallow with an intense amaretto flavor (not marzipan. NOT the same! Fun fact: Did you know amaretto is flavored with apricot pits, not almonds?). It was a bit too sweet for my tastes, but probably not quite the decadent calorie bomb I’d anticipated. And only later did I investigate and learn that it was a Shokokuss – but large enough to be called Jumbokuss. 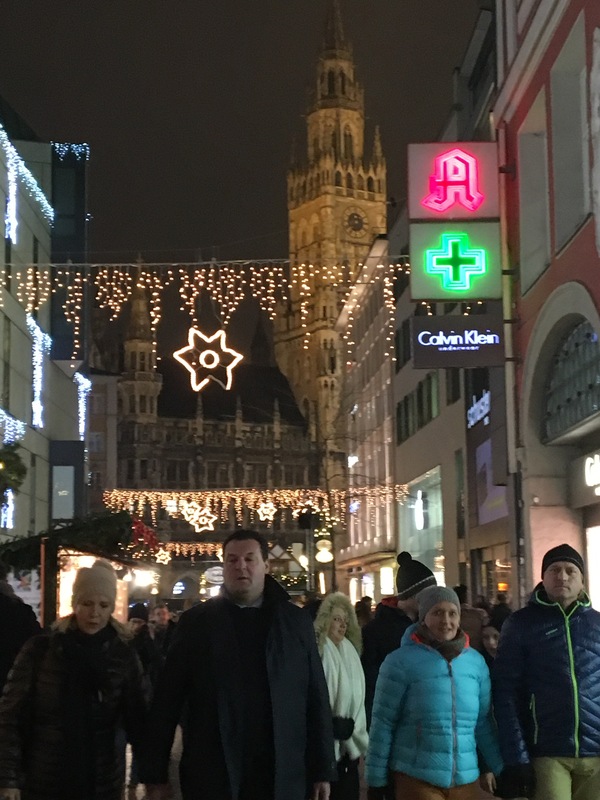 With the buzz of happy, slightly buzzed crowds, the majesty of Munich’s Bavarian architecture, and the cold pre-winter air, I definitely found myself enjoying the Christmas spirit, if only for a brief moment before business engulfed me. Germany really gets into sharing its Christmas spirit with the world. Even Munich’s airport has a not insignificant, charming open-air Christmas market outside Terminal 2. It’s a bit funny to see the rustic wooden stalls juxtaposed against the sleek, modern glass walls of the terminal, but if you have only an airport layover in Munich, I highly recommend you detour past security and visit the market for a taste of the Münchner Christkindlmarkt. 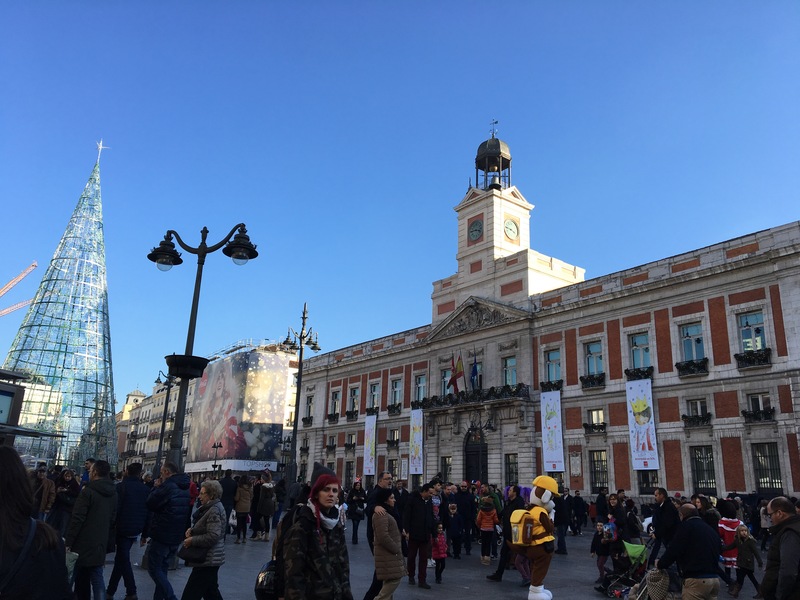 Several days later, I had the good fortune to make a stopover and visit one of my old university friends in Madrid. During that stop, I had the opportunity, however brief, to see Madrid’s version of the Christmas market. Many of its plazas have at least small markets that sell Christmas themed wares, including fresh greenery. You can actually deck your halls with fresh boughs of holly. Comparing the Madrid stalls with Munich’s, I noticed many similarities. The foods offered are slightly different – most popular are (overpriced) churros and hot chocolate. Ornaments are a bit more commercial – glass and plastic; crèches are ubiquitous but more often the figurines are ceramic instead of wood, and their elaborate mangers and inns are often made with mixed media – wood, ceramic, individually thatched roofs, and even blanketed with actual moss. Though i didn’t have the opportunity to do much shopping, I was grateful for another festive experience this busy holiday season. Returning to the USA, I’m reminded how Europe helps us all get into the holiday spirit. I am so thankful for my (safe) adventures in Europe this holiday season. My prayers go out to those families who were not so fortunate in Berlin this week. May the Christmas markets continue to shower their lucky visitors with holiday warmth and spirit, undeterred, for centuries to come.